I sometimes get the weirdest looks for saying this, but it’s true: I love the cold. To me, cold days are perfect for staying in, baking, watching TV under the covers... So good! I saw these cakes and they screamed “fall” – perfect to celebrate my second favorite season. Preheat the oven to 170ºC/338ºF. Grease and flour 12 individual cake or muffin pans or one 20cm springform pan. In a saucepan heat rum or brandy with oil, orange zest and juice. Place couscous in a bowl and pour over hot liquid. Cover with plastic wrap and leave to steam for 10 minutes. Uncover and fluff up couscous with a fork. Whisk eggs and sugar together until thick and pale. Stir this mixture into couscous along with remaining dry ingredients and cranberries. Spoon into prepared pans and bake for 15 minutes or until cakes spring back when touched. 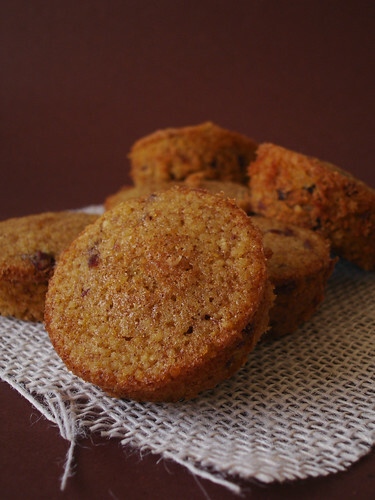 Mmm, these couscous cakes look amazing!!! I don't think it's weird at all to love cold weather--you can snuggle up, bake, and enjoy all those wonderful wintry and fall flavors. I love cold weather too:) this recipe is really interesting. I bet they were delicious ! I love couscous and I have never had them as a sweet. I will have to try. What a great way to use couscous! Hah, I love the cold-- more opportunities to glam up your wardrobe. Heh heh :) Not *freezing* though! 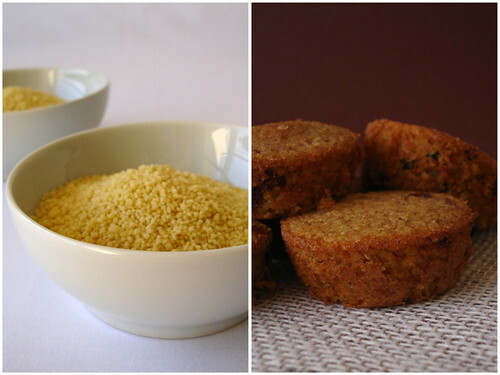 Wow, those couscous cakes are quite unique! I wonder what the texture is like? Wow, I really like couscous but I've never heard of using it in baked goods before. I love it with citrus and cinnamon so I bet I'd love this! I am putting these on my "to make soon" list. They look delicious. What a unique recipe! I will have to give these a try. You are the 1st one to leave me a comment! THANK YOU. I gave a look at your blog and it is just so great, pictures are amazing and recipes seem just so DELICIOUS! I love reading about you experiencing the opposite seasons as me there. While I am craving the warmth and the light, fresh, greenmarket fare, you are getting ready to hunker down to comfort food! I have never baked with couscous. I can only imagine the delicate texture. Must try this! Those look great! couscous is always in my home! I love cold, too -- you can always get warm, you can always heat up the kitchen with cooking and baking, and then you can always curl up with a blanket and a book and some wonderful little couscous cakes! Those look fun! I haven't seen anything like that before, but the flavors are all familiar and wonderful sounding. I hate the cold. I love the heat. These are lovely little cakes Patricia. Natalie, they had a very interesting texture! Melanie, I love couscous too but had only had it in savory dishes. I was really curious about these cakes! Anna, the olive oil adds lots of moisture to these. Heather, I hope you try them! Laure Sophie, thank you for stopping by, too - your blog is full of delicious food! Sarah, I have that feeling reading you and the others in the Northern Hemisphere, too, darling! Jennifer, thank you for stopping by! Brittany, these were completely new to me, too! There are lots of great things about cold weather! Like getting cozy under lots of blankets, and as you said, baking. 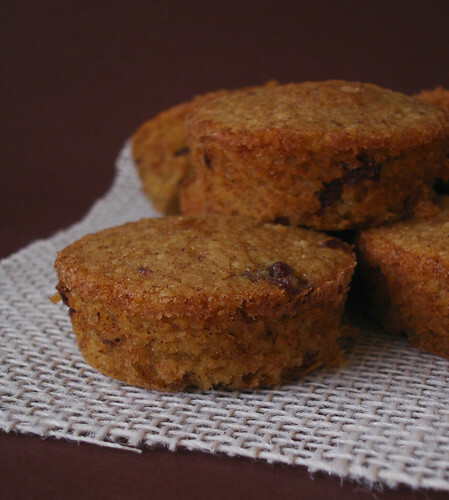 =) These couscous cakes look awesome. I've never seen such a thing. I've never had a cake with cous cous in before, they sound good. its a great recipe and really easy to make, thanks! i love couscous! but i've never had it as a sweet or a cake! gotta try it! Oh my goodness I am so THANKFUL for you and this recipe right now! I'm doing a report on Morocco and for my project I wanted to incorporate a taste of their country without going for the predictable presentation of couscous. But I'm subbing the eggs for egg replacer, hopefully that works out!